Northern Expressions Needlework: One more finish! After I finished CDT this week, I decided I wanted something blue. Daisy just wasn't calling to me yet. So I pulled out Sampler Cove's Enya and finished it up. 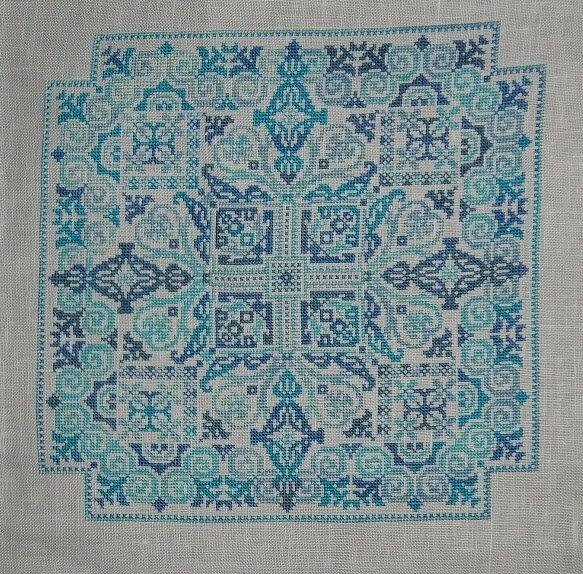 This one is stitched 1x2 on 45 ct white Florence from Graziano linen (one of my favourites!) using Waterlilies Mediterranean and Azure Skies. 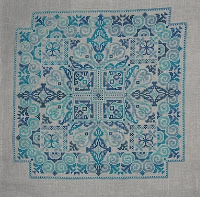 I really love this series from Sampler Cove, there are four in all and I plan to stitch all of them (though I'll need to order more of this fabric darn it. ), each in a different colour. I'm thinking the next will be purples, then one in pinks, then one in greens. Diane named them the Flourish series, but I re-named them Di's Divas. lol They're such fun little pieces, not too big, so they stitch up fast. And now I'm back to working on Daisy. :) I finished up all the pink and most of the yellow last night, and will probably finish her up this week so I can get the chart all done up. I also did some work for a customer this week. To say I've learned a lot about charting since I started designing would be an understatement. Looking back, I wish it were possible to re-do my older charts!! But alas, they're on the market. So I've started a "Corrections and additions" page here where I'll upload anything that people ask for. I've already added the corrections for Hearts Entwined, and I added a short tutorial of sorts for doing Hungarian Stitches. I had intended to get my website up and going this week, but I've not been well. At first I thought I had an ear infection, I had pain in my ear and down into my throat but it was bearable and nothing serious. I probably should have gone to the doctor sooner, because it turns out it was the start of a sinus infection. Had I caught it early I would have been alright, but as it stands right now, my whole jaw is inflamed and I can't even eat. The doc got me all straightened around and put me on antibiotics and a nasal spray and I should be right as rain in a couple days. I haven't tried chewing yet today, but I will say that the Flonase he gave me is doing it's job because it doesnt hurt to talk. The good news is that my back is sooooo much better. I don't know if the pain in my jaw/sinuses has me distracted or if it really is better, but I have a lot less pain in my lower back this last day or so. YAY! SOMETHING had to go right, right?? What a gorgeous finish! I really like the colours you chose. Nicole, I have loved seeing all your work you have completed this week. I love the colours you have used in your interpretation of these designs. You have been on a roll lately with all the finishes! I love the colour of this one! I hop you are feeling better soon!